I just visited Canada’s Supreme Court on my first visit to Ottawa. We had an excellent guided tour led by a law student, and I asked him what the current conservative government in Canada meant for the future of the balance of political power on the Supreme Court. He responded that, contrary to the US, the Canadian Supreme Court is not very politicized or polarized, and it is hard to predict how judges will vote based on who appointed them. I was curious about this, since it is clear that the US Supreme Court’s reputation has suffered from charges of partisanship, and most observers evaluate the court through a political lens. Every discussion of the recent health care ruling in the US seems to focus on whether the rulings were made based on legal or political motives and to assess the balance of power on the court. I asked our guide for more details, and he attributed the difference to the way that justices are appointed in the US versus Canada. In the US, they need to be approved by the Senate, which at this point means getting 60 of 100 votes. In Canada, they are simply appointed by the Prime Minister, and then rubber-stamped by the Governor-General, the Queen’s representative to Canada. According to the guide, the requirement for Senate approval politicizes the process. I’m not sure I agree with this assessment – if anything, it seems that requiring Senate approval should result in the appointment of more moderates, since often the 60th vote in the Senate will not be from the President’s party. The Prime Minister, in theory, has nearly unfettered power to appoint whoever will serve his political interests. So why does Canada have a Supreme Court that seems to be less partisan? I think the answer must be culture and tradition. It is not seen as acceptable for the Prime Minister to appoint justices for political reasons, and it is not seen as acceptable for justices to be partisan or to show obvious biases toward political factions. Canada has a long tradition of collegiality and compromise in politics, and it seems that this extends to the Supreme Court. I believe that US Supreme Court justices do not intend to be partisan. However, all people find ways to justify what they want to believe, and Supreme Court justices are no exception. If liberal justices think health care should be a right, they will find a way to see that in the law. If conservatives don’t think so, then they will find the contrary. So what the polarization of the US Supreme Court reflects is not just that the process is partisan, but also that most people’s world views become separated along partisan lines, making it hard to find truly moderate or neutral judges. It seems this is an increasing cultural characteristic of the US – for people to self-identify as liberal or conservative, and to have world-views that change in almost every respect as a function of this polarization. 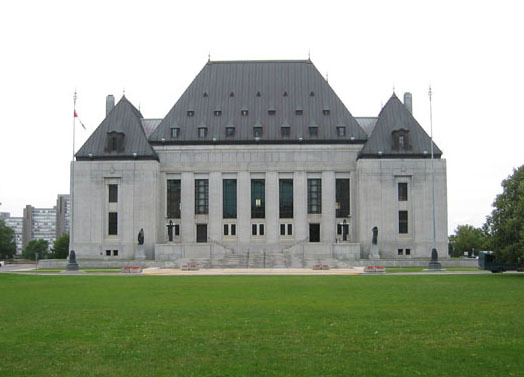 It also implies that in Canada, the absence of a political and polarized Supreme Court is a reflection of a culture in which the left-right divide is not a major part of people’s world-views, meaning that there is a large pool of judges that will not have unconscious biases toward one side or the other, should they attempt to remain neutral. This is actually a fairly depressing finding. It means that the situation in the US cannot be easily rectified without a major shift in how Americans think, and in the culture of law and its relation to politics. It also means that the Canadian system is at risk: the current right-wing Harper government seems to be increasingly learning from the American political playbook, using win-at-all-costs tactics to achieve short-term political victories, even though it breaks down the traditions of collegiality and compromise that have long reigned here. Perhaps, in the US, a place to start would be to require the Senate to approve candidates with at least 70 votes. This would force the nomination of moderate judges, and would force the Senate to compromise – no one on the extremes of either side could hope to have their candidates succeed. Over time, more and more moderates on the Supreme Court might allow decisions to become increasingly apolitical and a restoration of a culture of impartiality. What do you think? Is the US Supreme Court too polarized? Is Canada’s? How can we avoid that, and should we?